11th largest crude oil refinery in the world chooses XR-5 for process wastewater needs. The technical and cost effective success of geomembrane containment relative to traditional lining methods (clay, concrete, etc.) is well documented worldwide. Industrial and Petrochemical applications have been many of the first and longest examples of these successes. These geomembrane uses lead PEMEX (Petroleos de Mexico) to choose a geomembrane to line a process wastewater impoundment at their Salamanca Refinery. Salamanca is located about 200 KM northwest of Mexico City as shown in Figure 1. The Salamanca facility is the largest refinery in the PEMEX system, and the 11th largest crude oil refinery in the world. Finished products include various fuels, oils, and crude oil derivatives. Mexico's growing economy is producing a growing need for refined petroleum. Corresponding larger amounts of oily and other process wastewaters are generated in the refining process. An existing holding impoundment (Figure 2) needed added capacity, causing the local regulatory authority, SEMARNAP (Ministry of Environment, Natural Resources and Fishing Secretariat), to require a positive containment layer in conjunction with the pond expansion. This containment would require resistance to standard refinery products, feedstocks, and intermediates, be resistant to abrasive silicates from process operations and be able to withstand long term sunlight and temperature swings. Simple, secure, and reliable installation and maintenance were essential to the refinery. The upgraded pond was 4500 square meters with side slopes of 3:1, and required extensive renovation of the existing pond as can be seen in Figure 2. PEMEX Engineering performed a detailed comparison of lining materials, both natural and synthetic. Clay and GCL's were eliminated due to poor permeability to petroleum products and the need for protective cover. Asphalt was impractical because of its high permeability and incompatibility to petroleum. Concrete construction was impractical and expensive and presented another high permeability option. Several synthetic materials were also excluded: PVC due to petroleum incompatibility and cover requirements, Polypropylene due to petroleum incompatibility and HDPE due to cover and subgrade protection requirements which many consider necessary, and the higher number of required field seams. Ultimately, PEMEX chose a Reinforced Ethylene Interpolymer Alloy (EIA) and further specified that it be a Coated Fabric EIA (EIA-CF) with Yield tensile strength >2450 N (Grab, ASTM D751) and the ability to withstand sustained loading on the slopes at elevated temperature per Dead Load Seam Strength (ASTM D751). After a thorough analysis of alternative lining materials, PEMEX Engineering specified a geomembrane liner, a 0.75 mm reinforced Ethylene Interpolymer Alloy, based on its proved ability to withstand the design parameters. The liner used was 8130 XR-5® (EIA-CF), manufactured by Seaman Corporation, Wooster, Ohio, USA. Because the EIA liner was flexible, it allowed factory fabrication into 4 panels, each 35 m x 35 m, by Engineered Textile Products, Mobile, Alabama USA. The installer, REMMSA of Mexico City, deployed the panels by unfolding along the top of the slope to provide a 35 m wide sheet. It was then unfolded from the top of the slope across the prepared subgrade. Because of the heavy reinforcing in the EIA-CF liner, the material had very high puncture resistance. Therefore, the added puncture resistance provided by sand or geotextiles was not needed. Panels were overlapped and heat welded using commercially available hot air welding equipment. Either hot wedge or hot air could be used, but hot air was chosen because the equipment was readily available locally and allowed nondestructive testing. 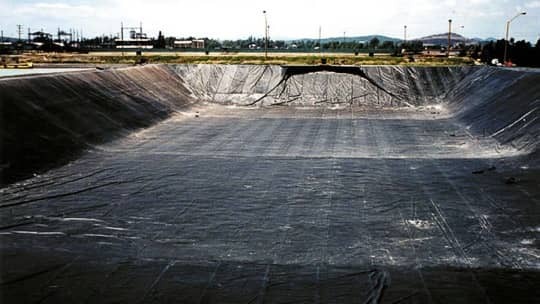 By utilizing the large geomembrane sheets, only 3 field seams were required. The installation followed a written Construction Quality Control (CQA) Plan which included certifications for the sheet material construction and factory fabrication, in addition to the field welding. Total installation time, including sealing inlet and outlet structures using conventional pipe boot and batten details was less than 3 days.